The rumor mill is ablaze about a supposed 10.5-inch iPad Pro, with the latest claims out of East Asia saying Apple has pushed up manufacturing of the alleged flagship tablet to make an early April launch. Citing sources within Apple's supply chain, DigiTimes on Tuesday said the company has moved up production of the unannounced 10.5-inch slate to March in preparation of a debut in early April. Apple is supposedly working to unveil the new iPad Pro model at a media event meant to mark the inauguration of Apple Park, which is set to open next month. DigiTimes has a less than stellar track record when it comes to predicting future Apple products, and the publication's assertions regarding an Apple Park keynote are likely unfounded. While employees are expected to start moving into the headquarters in April, construction of the on-site Steve Jobs Theater is not scheduled for completion until later this year. So far, various rumors have pegged the 10.5-inch tablet to launch in March, April and May. According to the latest scuttlebutt, Apple could debut new iPad products between March 20 and 24, though the company has yet to send out media invitations for the usual product keynote. 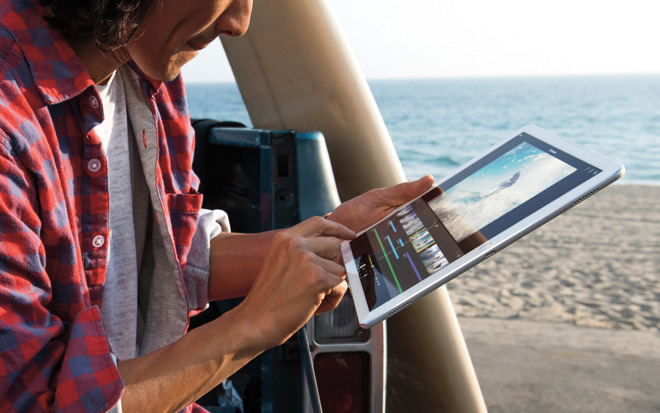 Whether or not Apple plans to debut its latest iPad hardware at a public presentation, evidence suggests a series of new tablet devices are being tested in and around San Francisco Bay Area. On Monday, mobile marketing firm Fiksu said it discovered four new iPad identifiers running versions of iOS 10.3 in its device tracking logs. While an accurate launch timeline remains elusive, industry insiders believe Apple will reveal a flagship 10.5-inch iPad Pro in the coming weeks. The device is said to be slightly larger than the 9.7-inch iPad Air, but boast a larger display thanks to a new design with thinner bezels. Alongside the 10.5-inch model, Apple is widely expected to release an updated 12.9-inch iPad Pro and a cheaper 9.7-inch variant that could take the place of iPad Air 2 at the bottom of the lineup.